What makes a magazine an award winner? At first, flashiness could be a factor—the surface design that catches a judge’s eye as he or she reviews hundreds of entries. But ultimately it takes more than that. Creating a truly worthy award winner requires a thoughtful process from beginning to end. It all starts with the editorial content. What are the stories that will immerse the audience in the subject matter? This factor is especially important for member-based publications. The good news is you have the audience—now you just have to inform them, engage them, and tell them things they don’t already know. If the editorial content is engaging, it is important that the visuals are as well. This means art-directing photographers to capture the meaning behind an article, whether it is through a portrait shoot or a photo essay. Take time to research and find imagery that is unexpected and spectacular. Work with illustrators to create images that add a layer to the story. Great design grows from good content—when the designer truly connects with the edit to bring meaning to the surface. It is this synergy that ultimately engages the reader and will bring attention to your publication—including awards. But it doesn’t end there. The quality of the final product is what makes a print publication unique. It is important that paper stock and printing are not short-changed. If the budget is an issue, the “less is more” approach should be used—less pages, more quality. Look for our article “alumni.magazine.edu: Publishing Your Alumni Magazine Online on a Blogging Platform” in the summer issue of Designer Magazine. 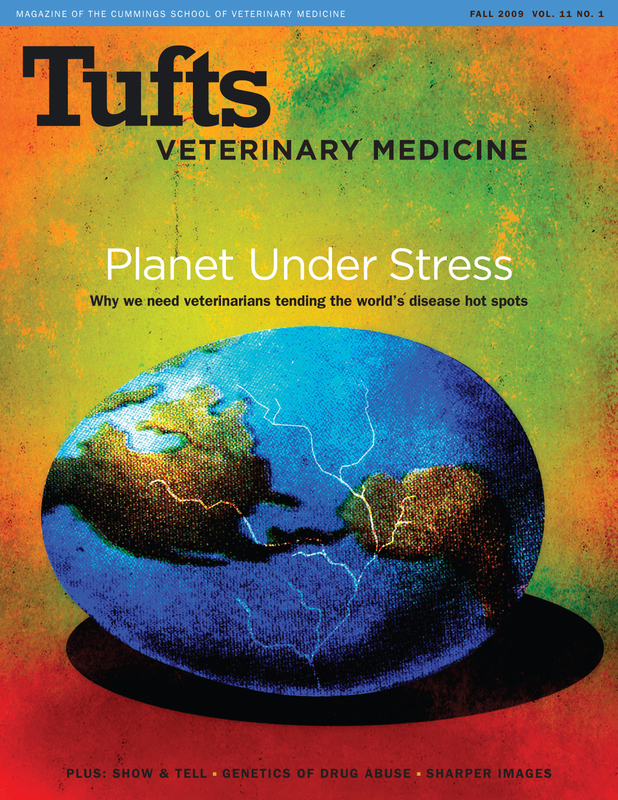 Tufts Veterinary Medicine received a Bronze award for Design Excellence from Association Media & Publishing. Creative Director, Kelly McMurray will be attending the annual meeting in Washington, D.C. June 14 – 16 to receive the award. We all know the economy is tight these days, and the belt is tightening even further on publication budgets. Perhaps you’re adapting by using freelancers instead of funding a staff position. Or maybe you’re forgoing freelancers and taking on a heavier workload yourself. Everyone, it seems, is doing more for less. So how do you get it all done? The design workload—marketing materials, flyers, brochures, conference materials, books, websites, not to mention the main publication—can be negotiated in a number of ways. While it is unusual for the art director of a publication to be hands on with anything beyond the scope of the magazine itself, this is not so for designers at associations, where the scope of work tends to include other materials. Some associations have a Renaissance designer who is able to do it all, while others opt for working with an outside designer or design firm. Which is the best solution for your association? This can only be answered by evaluating your design needs, budget, and availability of talent. First, it is important to look at the big picture of your annual workload, taking into consideration busy and slow times. It is doubtful that workflow will be even for the year, but when it is busy, can the flow be handled in-house? When it’s slow, are in-house designers using the time to tweak any issues with the visuals and the brand? Are they taking professional development classes, fine-tuning templates, and preparing for upcoming projects? Just be aware that if the slow period stretches too long, you may not have enough workflow during the year to justify a staff position and may decide to outsource all or part of the work. The single biggest factor in deciding how to accomplish your workload is your budget. With economic times still being tough, you cannot afford to waste money. Look closely at the workflow and the job descriptions to ensure you have the best solution for your situation. This is important as there is such a wide range of responsibilities at associations. Once you have a comprehensive overview of your project flow and worker capabilities, you may still be undecided on approach. Working in-house and outsourcing both have their pros and cons: When you have an in-house designer, you can walk over and discuss changes face to face, but mission creep and workflow can become a concern. If you’re working with a design firm, while a team will be dedicated to your publication, they will not be across the hall, or may not be as familiar with your association as a staff member would be. Create your own list of pros and cons to help you decide which situation is best for your association. 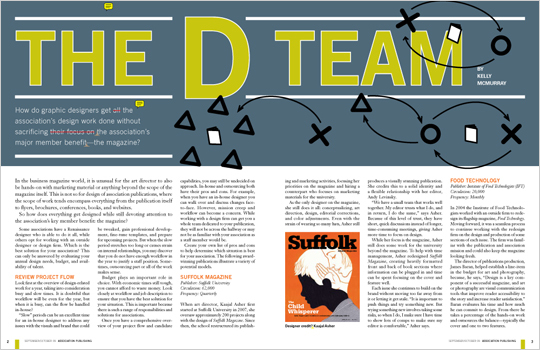 This article is an adaptation of “The D-Team,” published in Association Publishing. 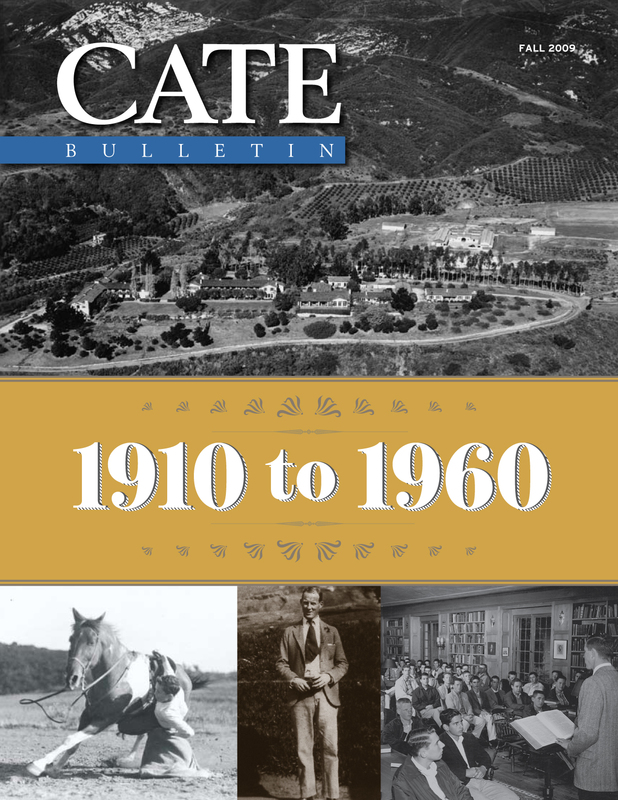 Our first issue of Cate Bulletin, 1910–1960, is one of three chronicling the history and future of the Cate School. The design we developed integrated imagery from the Cate School archives with newly commissioned work for a feel that is both historic and fresh. You can view the digital replication on the Cate School website.